This is a clear statement that I think is very well supported and correctly reflects the opinion of most climate scientists on the subject (and was re-affirmed in two recent papers (Jones and Stott, 2011;, Huber and Knutti, 2011)). It isn’t an isolated conclusion from a single study, but comes from an assessment of the changing patterns of surface and tropospheric warming, stratospheric cooling, ocean heat content changes, land-ocean contrasts, etc. that collectively demonstrate that there are detectable changes occurring which we can attempt to attribute to one or more physical causes. Apart from the undefined meaning of “most” in AR4 (which was subsequently clarified by the IPCC), the range 50.1-95% is rather imprecise in the context of attribution. However, Curry’s argument is far from convincing, nor is it well formed (why is there a cap at 95%?). Nor was it convincing when I discussed the issue with her in the comments at Collide-a-Scape last year where she made similar points. Since the C&W paper basically repeats that argument (as has also been noticed by Gabi Hegerl et al who have a comment on the paper (Hegerl et al. )), it is perhaps worth addressing these specific issues again. A group of researchers at Carnegie Mellon University is trying to get a better understanding of the views of earth scientists regarding various climate change topics. They have set up an ongoing poll to do this, called Vision Prize. It’s a short (10 question) poll, covering topics like the rate of CO2 increase, predicted future temperatures, sea ice and sea level states, and hurricane frequencies. Early participants can designate a $20 donation from the group to a charity of their choice, upon completion. Please take a few minutes to help them out if qualified. Update January 27: There is also another recent dog-based animations from Victoria (southeast Australia) explaining some of the key drivers of our climate and how some are changing. In the animation, the man’s path can be considered as analogous to a directional climatic change, while the path traced by his dog’s whimsical movements represent weather fluctuations, as constrained by the man’s path, the leash, and the dog’s moment-by-moment decisions of what seems important to investigate in his small world. What might the leash length represent? The man’s momentary pause? The dog’s exact route relative to concepts of random variation? The messages in this animation are similar to the recent results of Grant Foster and Stefan Rahmstorf in ERL (see post here). We’d also like to praise the TV-series ‘Siffer‘, hosted by an enthusiastic statistician explaining how most things in our world relate to mathematics. The series covers a range of subjects, for instance gambling theory, the Tragedy of the Commons, anecdotes about mathematical riddles, medical statistics, and construction design; it even answers why champagne from a large bottle tastes better than that from a smaller one. There is also an episode devoted to weather forecasting and climate. Success in understanding our universe often depends on how the ‘story’ about it is told, and a big part of that often involves how mental images are presented. Mathematics and statistics can describe nature in great detail and “elegance”, but they are often difficult and inaccessible to the average person. 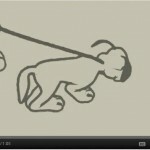 Conversely, the man-and-dog animation is intuitive and easy to comprehend. Similarly, Hans Rosling’s Fun with Stats provides some very nice demonstrations of how to convey meaning via the creative display of numbers. Almost 3000 non-science major undergraduates at the University of Chicago have taken PHSC13400, Global Warming: Understanding the Forecast, since Ray Pierrehumbert and I (David Archer) first developed it back in 1995. Since the publication of the textbook for the class in 2005 (and a much-cleaned-up 2nd edition now shipping), enrollment has gone through the roof, it’s all I’ve been able to teach the last few years, trying to keep up with demand. I hear it is the largest class on campus, with 4-500 students a year out of an annual class of only around 1400. Now the content of this class is being served to the internet world at large: Open Climate 101.